Lakers won back-to-back games for the first time since Dec. 20. 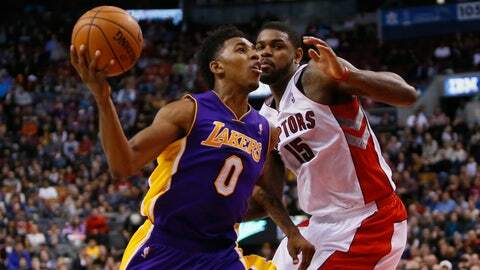 Nick Young returned from suspension to score 29 points, Pau Gasol had 22 and the Los Angeles Lakers beat the Toronto Raptors 112-106 on Sunday, just their third win in 15 games. Young, who was suspended for Friday’s victory at Boston after throwing a punch at Phoenix’s Goran Dragic last Wednesday, scored 14 points in the fourth quarter as the Lakers overcame a 19-point first-half deficit. They won back-to-back games for the first time since beating Memphis on Dec. 17 and Minnesota on Dec. 20. Ryan Kelly scored 17 in his first career start and Kendall Marshall had 10 points and 11 assists. 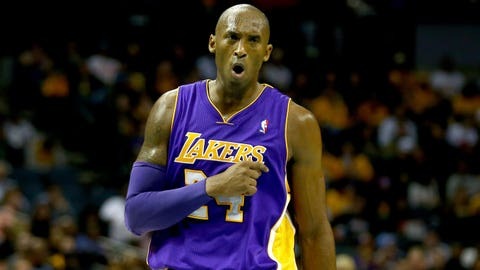 The Lakers reached the midway point of the season with a record of 16-25. DeMar DeRozan scored 23 points, Kyle Lowry had 21 and Patrick Patterson 17 as Toronto’s six-game home winning streak came to an end. The Raptors, who won 106-94 at Los Angeles on Dec. 8, failed to record the first season sweep over the Lakers in franchise history. Amir Johnson had 13, Greivis Vasquez 11 and Terrence Ross 10 for the Raptors, who have never won consecutive home games against the Lakers. Vasquez made a hook shot, then stole a pass from Jodie Meeks and, after a pair of misses, banked in a jumper to put the Raptors up 94-91 with 6:42 left. Young’s 3-pointer with 3:40 to go gave the Lakers a 100-96 lead, their biggest of the game to that point, causing Toronto to call timeout. Amir Johnson later fouled Kelly on a 3-point attempt, and the rookie calmly drained all three free throws to give Los Angeles a 105-101 lead with 1:58 remaining. Kobe takes shot at Rajon Rondo, but out of respect. Young’s third 3-pointer of the fourth quarter put Los Angeles up 108-103 with 1:21 to go. The Raptors led 50-31 with 7:33 left in the second quarter. But Wesley Johnson hit back-to-back 3-pointers as the Lakers rallied to cut the gap to 58-54 at halftime. NOTES: The Raptors were without G John Salmons (back) and F Tyler Hansbrough (left ankle). … This was the third stop on Los Angeles’ season-long seven-game road trip. The Lakers will also visit Chicago, Miami, Orlando and the New York Knicks before returning home Jan. 28 to face Indiana.